Vaucanson's career divides sharply into two parts. In the first he appears as the creator of automata; for all the underlying enquiry into the secret workings of nature,he is an inventor of mechanical novelties. In the second half he takes on the reform of the silk industry, his goal the practical improvement of industry through technology. To some he is among the heroes of innovation, with a series of machines which he left to the Musée des Arts et métiers – spinning mill, loom, reels – which fuelled the industrial revolution. To others he personifies the ills of early capitalism: the imposition of the “expert” on traditional industries, factory models, profit based on technological innovation regardless of the human cost, indeed the transfer of the concept of “man as machine” to the economic sphere with all its attendant ills (pamplet by Olivier Serre). In reality, fortunately or unfortunately, Vaucanson's innovations had little immediate practical outcome and his visions of large-scale manufacture remained as much a dream as his automata. Vaucauson's first involvement in the silk industry was as a government agent. In 1740 Louis Fagon, director of the central Bureau du commerce, recommended the new darling of the scientific community to Controller General Orry to investigate silk manufacture, which was causing concern due to French weavers' dependence on imported silk thread from Piedmont. 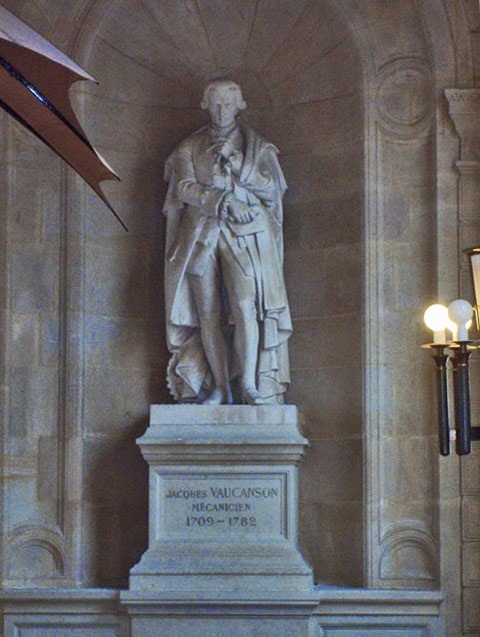 In the 18th century not quite “industrial espionage”, but travel to gather information, had became something of a feature of government action, though it has to be said that Vaucanson's credentials for the job were by no means clear. The heart of the problem was not so much the production and initial processing of raw silk - Orry had had some success in setting up small scale manufacturing (les petits tirages) in southern France - but the clear superiority of Piedmontese in silk throwing, the industrial process by which a strong finished silk thread ("organzine") is created by twisting and winding onto bobbins. In Piedmont this was carried out in sophisticated water-mills. The Piedmont industry was heavily regulated at every stage. Vaucanson became convinced that strict enforcement of regulations was the key to Piedmontese success; French inferiority, so his report claimed, was due not to natural factors, but to ignorance, indiscipline and disorder. Vaucanson's remedy was, to say the least, thoroughgoing. He proposed that the state should centralise silk throwing in a number of great Royal Manufactures, funded by a company composed of the wealthiest Lyon merchants and employing silk mills and spinning machines invented by Vaucanson himself and operated according to his detailed regulation. Seven pilot plants were envisaged, two to be installed in Dauphiny, Provence, and Languedoc and one in the Vivarais. Each would employ 100 women in reeling silk, another 100 workers in making yarn, and 80 people in preparing warp and weft and in weaving, together with supervisory personnel and certain specialists. The investment for buildings and machinery, Vaucanson calculated, would come to 600,000 livres, the annual payroll and cost of maintenance and fuel to 243,000 livres, and the consumption of raw materials to 980,000 per year. Sales should amount to 1,655,00 livres, which allowing or interest charges of six percent on the investment would leave a yearly profit of 336,000 livres. In a world of conflicting local jurisdictions, small-scale production and hand-written ledgers, Vaucanson’s accounting precision was as much a dream as was his pursuit of the perfect mechanical man. Yet he seems to have been taken seriously. As Gillispie comments, “That a kind of mechanistic Saint-Just should think in terms of a clean sweep is less surprising than that seasoned officials - themselves swept off their feet, evidently - should have attempted to act on so technocratic a recommendation"
Vaucanson's loom for figured silks (reconstructed), Musée des arts et métiers, Paris. Despite the fiasco at Lyon, Vaucanson's star remained in the ascendant. An emphasis on improvement, education and emulation privileged Vaucanson's inventions which were lauded in the press and continued to command popular attention. 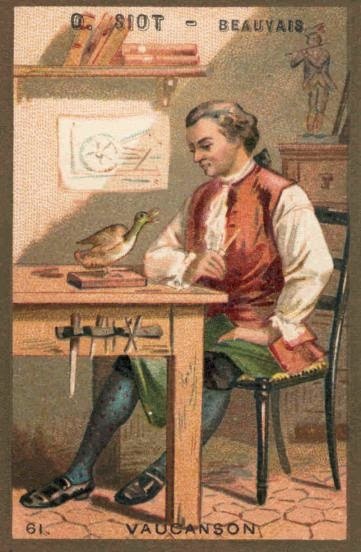 Under the direction of Trudaine from 1749 the Bureau du commerce itself turned away from regulation towards a policy of diffusing new technologies and educating manufacturers and merchants in the provinces. Vaucanson was able to abandon government office and evolve for himself the role of professional inventor (The Bureau paid him an annual salary of 12,000 livres). In 1745 it was an article in the Mercure de France on Vaucanson's automatic loom which prompted the comte de Maurepas, to force through his election to an unenthusiastic Academy of Sciences. (In 1757 he was elected to the prestigious position of "associate mechanician", beating Diderot to the post). He was invited to make a public presentation of his latest innovation,a machine for automating organzine production, for which he was awarded 10,000 livres. His accompanying report renewed the attack on traditional small-scale production, les petits tirages, which left the manufacture of raw silk in the hands of "people from the countryside, unable to correct themselves and normally little inclined to allow others to instruct them"
"Espace Deydier" at Pont d’Ucel. 1744 to 1751 were Vaucanson's great years of technical contribution to the silk industry, with a whole catalogue of inventions [automatic loom, draw-loom for figured silk, throwing machine, mill for organzine production, mangle for creating watered (or moiré) silk]. All were aimed at improving quality, saving labour and standardisation of worker input. As Gillispie notes, all could have relatively easily been adapted to steam power. Despite the early resistance in Lyon, further government attempts were later made at implementation, this time not by direct intervention but by established local entrepreneurs. Negotiations with Enfantin in Romans with the Jubié brothers in La Sône, and with the estates of Languedoc over enterprises in Montpellier, met with limited success. 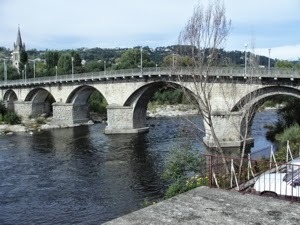 The only substantial venture was that Henri Deydier at Pont d'Aubenas in the southern Ardèche. Deydier was charged by letters patent of 5 September 1752 to create at his own expense a Royal manufacture for the spinning and throwing of silk with 25 spinning mills, 25 organzine mills and 60 spinning machines ("tours de tirage"), all to Vaucanson's designs. He was contracted furnish 6,000 livres of spun or milled silk over ten years. A light and airy model workshop was designed by the academician Guillot Aubry and Vaucanson himself, who lived nearby and was a close associate, came to oversee the work in person. The manufacture even included a school to train female operatives in the new technology. However, it took two years to get the machines installed and maintenance was always problematic. Having returned a modest profit for a number of years, even this factory was finally forced to close in 1774.
p.413-421. Extracts on Google Books. Pierre-Marie Gonon. Vaucanson à Lyon, en 1744: documents historiques pour servir à l'histoire de la ville de Lyon, au XVIIIe siècle (1844). 26p. 1. Automatic silk loom. (1745) Assemblies operated from a single input of power, which could be a man (working a pedal), a mule or donkey, or a mill-wheel. 2. Draw-look for brocade and figured silk (?1748). Following the work of Bouchon and Falcon, Vaucanson adopted a system of perforated paper mounted on a roller (rather like the mechanism of his automata). 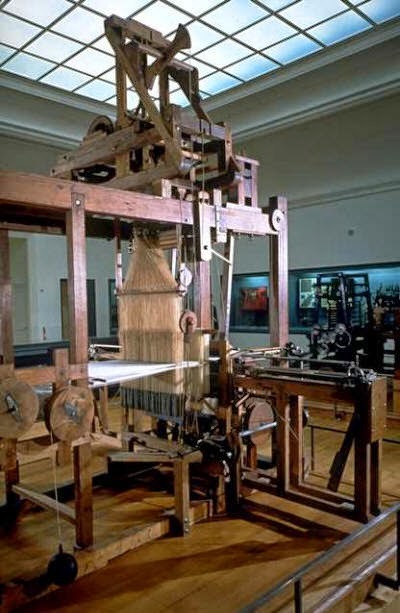 It was this loom that, rediscovered, became basis of the Jacquard loom. In the mechanism of Vaucanson's loom the hooks that were to lift the warp threads were selected by long pins or needles, which were pressed against a sheet of punched paper, that was draped around a perforated cylinder. Specifically, each hook passed at a right angle through an eyelet of a needle. When the cylinder was pressed against the array of needles, some of the needles, pressing against solid paper, would move forward, which in turn would tilt the corresponding hooks. The hooks that were tilted would not be raised, so the warp threads that were snagged by those hooks would remain in place; however, the hooks that were not tilted, would be raised, and the warp threads that were snagged by those hooks would also be raised. By placing his mechanism above the loom, Vaucanson eliminated the complicated system of weights and cords (tail cords, simple, pulley box, etc.) that had been used to select which warp threads were to be raised during weaving. Vaucanson also added a ratchet mechanism to advance the punched paper each time that the cylinder was pushed against the row of hooks. The idea behind the loom of Vaucanson was ingenious and technically sound, the prototypes also worked reasonably well. The problem, though, was that the metal cylinders were expensive and difficult to produce. Moreover, by their very nature, they could only be used for making images that involved regularly repeated designs. Obviously, by switching to new cylinders it is possible to produce designs of open-ended variety, but in practice the switching over of cylinders proved too time-consuming and laborious. A few examples of the loom did go into production, but it never really caught on and was soon discontinued." 3. Spinning machine [tour à la double croisade] for coverting fibres reeled from the cocoon into raw silk. The machine used a system of gears to automate the "croissade", the highly skilled preliminary twisting process associated with the preparation of silk thread. preliminary twissting making the spinners' expertise superfluous. Vaucanson was awarded 10,000 livres by Bureau for his design, though it was strongly opposed by the Jubiés. 4. Mill for the production of organzine (1750). In 1753 Vaucanson accepted 20,000 livres from the Fabrique in Lyon to study the possibility of a"calandre à moirer" . A system of metalic cylinders serres in which two piece of taffetas were applied one against the other. Installed in 1753 in a factory in Tour.